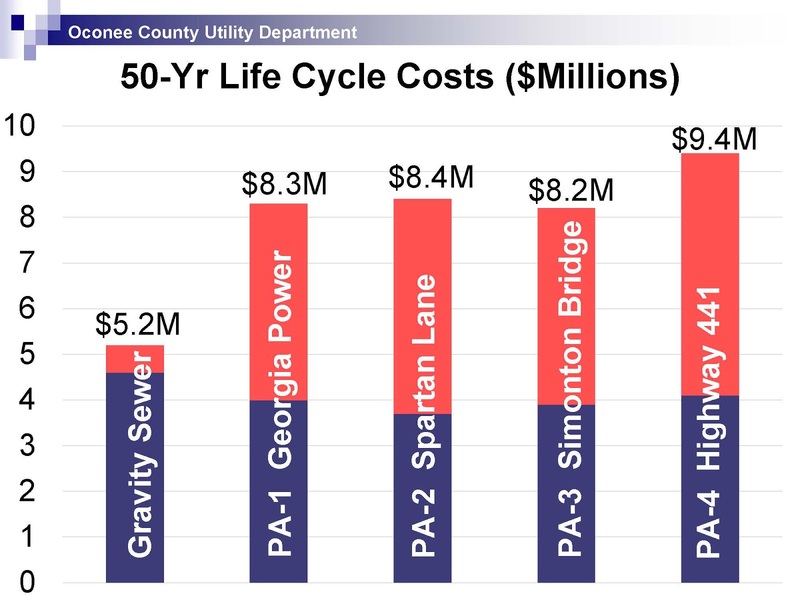 The slide, according to Haynie and his consultants, showed that running a sewer line down Calls Creek is the most cost effective way of getting treated water from the county's Calls Creek wastewater treatment plant on the edge of Watkinsville to the Middle Oconee River. People in the audience disputed the calculations and the assumptions that lie behind them, arguing that the disruption to the neighborhood and the creek itself was more important than any identified cost savings. Then Haynie said he would welcome questions. “I don’t need a microphone,” someone at the front of the room shouted out immediately. He did not identify himself. “I said it was the most cost effective method of moving the wastewater,” Haynie said in response. It was clear from the questions that followed over the next hour that many in the audience didn’t believe Haynie’s assertion that the final decision had not been made and would be a political one, made by the Board of Commissioners, not by him. Haynie invited five consultants employed by the county to assist him in the presentation, and they covered topics ranging from the quality of water in the county’s streams, the current demand for drinking water, plans for a new water tower, permitting and construction plans for an upgrade to the Calls Creek plant, and plans for new sewer lines in the county. A little more than 45 minutes into the presentation, Jimmy Parker of Precision Planning Inc. of Monroe got to the question on the minds of most of those in the audience. “So what happens beyond 1.5 mgd and the assimilative capacity of Calls Creek?” Parker asked. The state has determined that the creek can only handle 1.5 million gallons per day of treated wastewater, but the county has said it wants to expand the existing plant to 3 million gallons per day in the near future and perhaps even more in the long term. The county had proposed a gravity feed sewer line down the Calls Creek corridor, he reminded the group, but those present hardly needed that background. The county looked at four alternatives, he said. The first of these would follow much of a Georgia Power easement. The second would follow Spartan Lane. The third would follow Simonton Bridge Road. The fourth would follow U.S. 441. All four alternatives would require pumps, rather than simply gravity, Parker said. Parker said his analysis showed that the gravity feed line would cost the most to build, at $4.6 million. 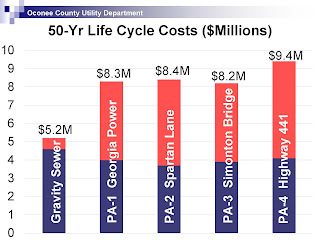 But the gravity alternative would have a 25-year-life-cycle-cost of only $4.8 million, he siad, compared with $5.9 million for the cheapest alternatives, the Georgia Power Line and Spartan Lane routes. The 50-year-life-cycle costs showed even greater differences. The gravity line would cost $5.2 million, while the cheapest alternative, the Simonton Bridge Road route, would cost $8.2 million. Much of the discussion in the hour after Haynie ended his presentation focused on that analysis, with many arguing that the cost differentials were trivial given the impact the project would have on the residential neighborhoods along the creek. Jim McGarvey, president of Friends of Calls Creek, which has been fighting the pipeline proposal since it was first announced earlier this year, was most outspoken. He said the project already had adversely affected home values in the neighborhoods along the creek and urged the county not to delay any longer its decision on which alternative would be chosen. It is unlikely that Oconee County Commission Chairman Melvin Davis, soon–to-be-elected incoming Chairman John Daniell and Commissioner William “Bubber” Wilkes, in the audience, found talk of the “dark times” very pleasant. All were on the Commission during that period. Commissioner Jim Luke and Commissioner Mark Saxon, also members of the Commission in 2014 and 2015, did not attend the meeting last night at the Community Center in Veterans’s Park. Mark Thomas, whose name will be on the ballot in November to replace Luke, also was not at the meeting, but the three candidates for Post II on the Commission, Ben Bridges, Chuck Horton and Marcus Wiedower, were there. Haynie made the surprising announcement that the county does not need the water collecting in Hard Labor Creek Regional Reservoir in Walton County in the near or mid term. The Board of Commissioners, over the objections of Horton, who was on the Commission from 2004 to 2012, and then Commissioner Margaret Hale, voted to join Walter County in that project. Haynie said the county can get all the water it needs in the foreseeable future from the Bear Creek Reservoir. The county is responsible for about $20 million in debt for the Hard Labor Creek reservoir project. The county has put the PowerPoint presentation given by Haynie and his consultants at the meeting last night on its web site. The video below is of the entire meeting. Sarah Bell assisted with the video recording. OCO: Water and Sewer Town Hall Meeting 10 26 2016 from Lee Becker on Vimeo. Note: I added the phrase "in the near or mid term" to the end of the first line of the section on Hard Labor Creek to clarify that Haynie had NOT said the county would never need the water in the reservoir. I believe the sentence is misleading without this correction and apologize for the error. I thought Jim published a letter asking for any decisions to be delayed until at least 2017 when the new BOC is seated? The annual cost differential for one of the more expensive routes is only 40-60 thousand dollars. This should be borne by the people/businesses that are served by sewers. In reality, the county should be working with Athens to take a regional approach and quit this petty bickering. Pay them to join their waste water facilities and have the cost borne by the users. Melvin Davis and Jeff Benko met with the mayor and manager of Athens, and the Athens leaders said they would not agree to a sewer partnership. Give credit where credit is due: our Oconee folks swallowed their pride and reaching out for a potential sewer partnership. If anyone is holding up a partnership, it's our friends on the other side of the river. as said just above and reproduced here....in total agreement. this is a disaster for oconee county that can easily and cost effectively be avoided. somebody stop this! Wayne obviously struggles with math. He had no answer when several citizens made the obvious point that the "50 year stretch" would equal a few more dollars per month if the county chose the less intrusive routes. (441 looked the best) Each time a citizen would make a valid point, he had no answer. I was glad to see Chuck Horton in attendance and actively participating. He had several excellent points. The other two candidates were there but did not speak. I don't think that had any idea how to even begin to help. 1. Someone please get Wayne some math help. Also teach him the word Integrity as it was obvious that he was not being honest. Let's remember folks.....WE are in this mess because there was a misappropriation of funds----funds were diverted to pay off the jail....the funds were marked for waste water plant upgrades and pipelines. It was spent on paying off the jail. The citizens passed the SPLOST to fund waste water improvements, NOT pay the jail off early. That is called a misappropriation of funds and the Calls Creek Citizens should not be forced to pay for that "mistake".....or as their attorney would call it, possible illegal use of funds. Bottom line: This thing is going to get ugly. These polite citizens are not going to stand by and let it happen. So if Melvin, Wayne and crew want to push it, the digging into how we got to this point will continue. You have an option before you that will effect 5 houses.....you might want to look at that before your can of worms gets opened even further. any evaluation of alternatives that does not consider cooperation with athens clarke county is simply stupid. i'm sure that a win-win agreement could be made and this is the recommendation by state-level agencies as i understand it. i expect that both sides went in with unrealistic demands in their one-time short meeting a few months back. i would think that legally this alternative must be evaluated rather than simply ignored without the slightest reason why. it clearly will be the most cost-effective, environmentally sound, and citizen friendly. and the boc owes it to us for the horrible growth decisions they have made that have brought us to this...selling business/industrial/high density residential sewage capacity that the county simply never had. devastation of the county on all dimensions (financial, ecological, property values, quality of life) is not within the purview of haynie or the boc. Way back when Chuck was voting to go into a partnership for Hard Labor we should've been looking at local solutions to water and sewer. We as citizens have been blindsided by a commission who's only thoughts of future were unrealistic water sources and selling Epps Bridge to Atlanta's finest. It's time for new minds and fresh ideas. The Director was tasked with developing a sewer strategy that will alleviate the current sewer problem, he took an existing plan, developed it along with alternatives, this is what he must present to the Board for THEIR consideration. He did his job now the Board which YOU elected will do theirs. Barb, if ACC does not want to play ball, you gonna make them? haynie has not done his job if he has not evaluated the athens-clarke county alternative. why has he not? the long and short answer is melvin davis. and, geez, certainly other criteria than the minimum $ cost over 50 years should be considered and so many have stressed for so long. the tail is wagging the dog currently and none of this makes any sense. Anonymous 12:59 - I believe Dr. Becker stated in his post that Mr. Horton voted against the Hard Labor Creek partnership when it came before the commission. Anon 7:59 AM couldn't be more wrong. Oconee did Athens wrong multiple times regarding Epps Bridge development. Melvin and Benko need to NEGOTIATE with Athens-Clarke. Oconee desperately needs sewer capacity. A competent commission chair and county manager would find middle ground with ACC. Now King Melvin and Benko can say, we had a ten minute meeting with Athens-Clarke and couldn't agree...now we have no choice but to go with the Calls Creek sewer pipeline. John Daniell, Bridges, Horton & Wiedower need to demand that Melvin, Haynie, Saxon, Bubber and Luke defer any Calls Creek decision until the new commission takes seat in a few weeks. Jim McGarvey & the Friends of Calls Creek: Y'all need to do the same. Demand this lame duck commission wait a few weeks...the only hurry is Melvin trying to prove once again he and he alone is in charge. It's not suprising that Bubber, Saxon and Luke had made no public stance on Calls Creek. Does Bubber pay attention or bring anything to the table? Does Saxon ever stand up for anything? Does Luke really want to be a commissioner any more? Lance Haynie: When a resident makes a valid point at a presentation, how about admitting that it's a valid point instead of silence??? We have intelligent county residents; on Calls Creek, they are very informed and have brought up very important concerns that you and Melvin have brushed aside or ignored. John Daniell: We expect leadership from you. Your public silence on this most urgent matter is not a good omen for your upcoming term. You're the new commission chair. Melvin had his 16 years. Very disappointed you haven't stepped up to the plate and made it clear that a decision on Calls Creek is too important for a lame duck commission! As one county official described it, the Town Hall meeting at Veterans Park was "wild and woolly". The most startling aspect of the two hour meeting was the cost comparison of running a gravity sewer pipe down our Calls Creek or a pumped pipe down Hwy 441. When Utility Director Wayne Haynie showed the marginal differences, between the two routes, in costs over a 25 year span, FOCC'r Craig Findly quickly pointed out it only amounts to $40,000 a year more to go 441. Quickly, other FOCC'rs calculated that its only $4 per year per utility customer or .35 a month! A mere $100 over a quarter century. If you have 300' of Creek frontage, expect to get only $4,500 for your easement. Jimmy Parker of PPI, said we need to expect a 40'construction swath thru our backyards - not the 30' mentioned earlier. That is on top of the 25' setback. So, envision a football field size "Redzone" going 2.9 miles down Calls Creek thru our backyards. The County will periodically send equipment down the easement to clear any potential tree growth. The County is going to try to start construction of the Calls Creek Plant Phase 1 next month - December by using a less than standard permitting process. We all absolutely need to attend the November and December BOC meetings. Please note that CHUCK HORTON and MARGARET HALE voted NO on the Hard Labor Creek project. Davis broke the tie to vote yes. Chuck Horton has continued to keep himself informed about County issues ever since. The other two candidates for Post 2 have not. I know: I go to all the meetings, and they have only recently come to some of them--since they decided to run for office. We need people who are committed to Oconee County, not just to running for an office.